My Seniors plan their meetings and the do a fabulous job. 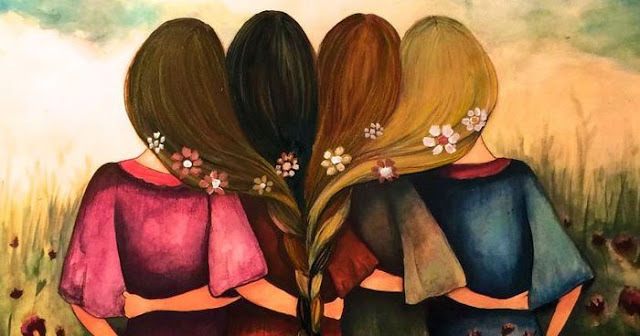 So, not only do I have a 15 year old that is pretty much self-sufficient, I also have a troop of 6 girls that are also not needing all of my attention, planning, and help... it's a trying time for me. I need to be needed... just sayin'. 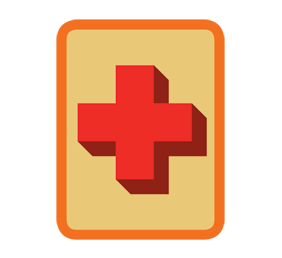 Girl Scout L planned the First Aid badge... we're taking a trip to the Firehouse for most of it, because there was not an ER doctor to be found that could help us out. Most of the requirements will be met at the firehouse with our amazing Firefighter and First Responder guest. Make posters to share with other teens about the facts about drug overdoses and alcohol poisoning. and because I need to feel needed (It was part of her plan to make a first aid kit... don't leave me hateful comments about girl-led, etc. 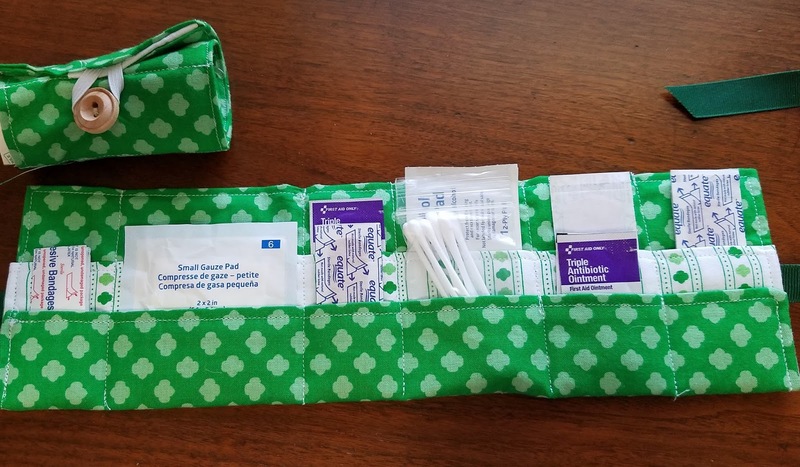 Try to just sense the humor of a "mom" moving to a new chapter) I whipped up roll-up first aid kits for the girls to fill with first aid supplies (I used this plan and sort of tweaked it to fit my need.. fabric is Riley Blake Girl Scouts). 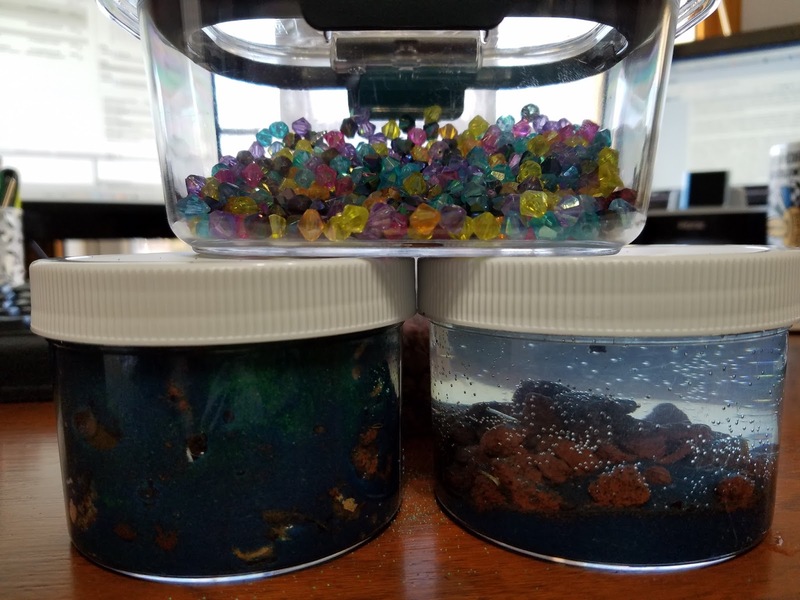 We'll go over the proper use of each supply and do a few demonstrations and what else they could be used for in case of emergency. 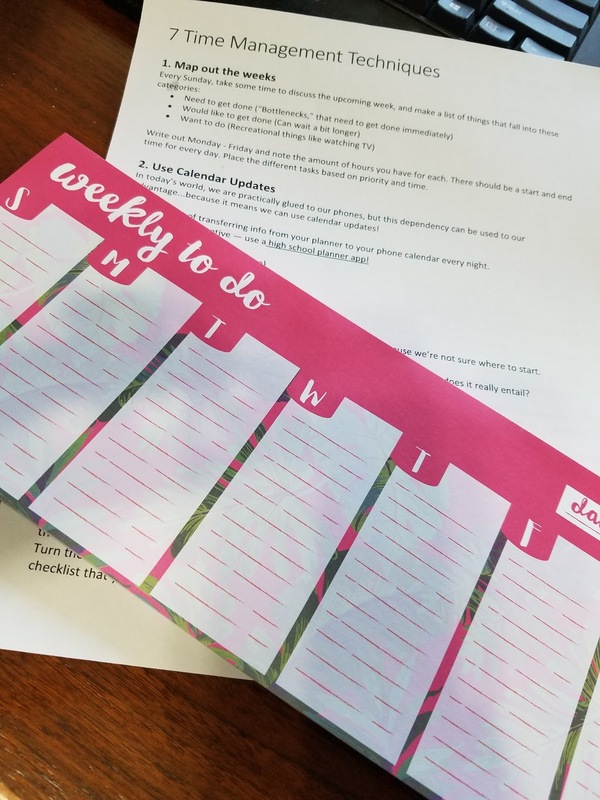 One of the things that I have struggled with over the past year is feeling prepared for meetings with my troop. Shocking, I know. Back in the day, aka Brownie days, it was simpler for me. At the beginning of the year, the girls chose the badges we would complete by marking them on a sheet. I would tally up the votes and then assign them to the meeting where they would work the best. I would make a list of supplies and gather them up, haul them with me, unload, set up, and walk to the school across the street to meet them to walk back to the church. Oh! The good ol' days. Sort of. I also remember lugging 12 scrapbook albums back and forth for each meeting for 8 months because I had a brilliant idea of a time filler... wow... I was ambitious! Now, the girls are Freshman... which means they are Senior Girl Scouts. Telling someone outside the scouting world you have Seniors is so confusing, btw. The girls still plan their badges for the year at the beginning of the year, but in a different way using the House Method. Then, they assign the badges or call dibs on the badges they want to lead. 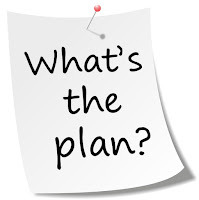 They rotate through the months who will be the one to put together the plan and supplies list. Then, I review the plan to make sure they are meeting the requirements and gather the supplies (sort of). We are holding meetings at my home now and that is where my problem is coming in. I find myself procrastinating about getting supplies gathered, because it's "here" and I can just grab it if we need it. Yeah... which means I spend at least an hour making a bazillion trips up and down the hallway to get "just one more thing". I'm telling you this because I need you to be my judge and jury. I want you to help keep tabs on me. I hope to improve my preparedness for meetings... starting with tonight! I have a plan. I'm going to share it with you so you can keep tabs on me and maybe glean something for yourself, too. Whether you meet at a place where all your supplies are or whether you are carting them back and forth, I hope this will help you and me improve. Over the next few weeks, you can look forward to posts about the following. I'll update this post with links as soon as they are done and posted, too. Stay tuned!! THIS is what I love about Girl Scouts... I've been silent for a few weeks. I'll blame busy schedules and too much fun. It isn't that I haven't had thoughts about various topics, but it took one close to my heart to make me speak. This article came out in the NY Times. First, I need to say "Bravo!" to the 10 year old girl who noticed something many others have and many have done research on. But, she is a girl after my own heart, because she decided it needed to become a patch program. I love patches... but, I LOVE this idea even more. Go read this and then come back for my thoughts: I’m 10. And I Want Girls to Raise Their Hands. This isn't said in the article, this is my take away... in 2017 in the USA girls/women are only limited by our own fear. It isn't that girls are told not to raise their hand... I do believe some teachers pass over the girls, but that's a whole other fight. It starts with girls. We need to raise our hands. We just don't do it for reasons listed in the article... fear, embarrassment, overshadowing. (and my opinion.. unfortunately, many times, the ridicule and embarrassment is because of our own gender pressures!! stop being mean girls!). This concept needs to start at a young age, but you're never too old to learn and apply something new to your life. If you want equality, then you must take the risk and raise your hand... put yourself out there... leap... stop whining it isn't fair (yes, I said whining... no it isn't far-fetched to understand that griping to our girlfriends about how we were passed over for the last career advancement or employment opportunity isn't whining... ) and do something about it (and remember not to be mean girls! use your mind and present yourself professionally... you'll have better results. It drives me nuts when a grown woman resorts to tactics beneath her intelligence to get her way... it's mean, it's unprofessional, and no one takes her seriously.. this doesn't just apply in the office, either). I can wholeheartedly say as a female tech, it isn't easy... it isn't always fair... it isn't "right"... but you stand confidently and represent and pave the way for the next generation. 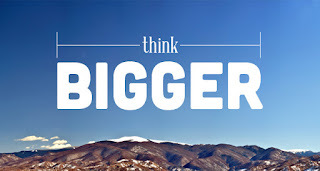 It isn't all about you... think bigger picture. Yes. It gets old. Yes. It makes you so frustrated you want to scream. Yes. It can feel like a continual fight to be given the level of respect you deserve. But, at the end of the day... it is worth it. Hopefully it's easier for my daughter and for yours. Then, easier for their daughters. It's a process and it won't change overnight. I'll also add... stop shaming young women for making decisions about their lives they feel are the right move. We need intelligent women in the work force, but we also need them at home shaping the minds of the next generation. What she feels is the right place for her, is the right place for her. No matter if you agree with the choice or not. It's okay to be a mom who works outside the home. It's okay to be a mom who stays at home with her kids. It's okay to be a wife who devotes her life to her family and friends. It's okay to be single and chase your dreams... Married women can chase their, too, btw. We need to respect the choices we all make and understand until you walk in their shoes, you don't know what the perfect fit for anyone else is... most of us are still searching for our own perfect fit. Cut each other some slack. Support the decisions. Value the friendships. Respect one another. I was overwhelmingly excited to coordinate a special evening for my girls to bridge from Cadette to Senior. They chose to do this in the Fall, rather than Spring, because two of them were earning their Silver Award and needed the Summer to wrap it up. That just gave me more time to think about how to make it special, which was greatly appreciated. Let me give you the rundown for the evening. 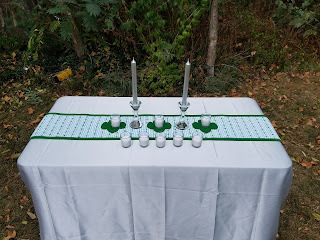 We did several different ceremonies in one and held it in the backyard at my home. Court of Awards, Silver Ceremony, and Bridging. Badges and patches were stapled to cardstock sheets and covered with precut scalloped paper. I printed their names for the front of their packet. Badges and earned awards that go on the front of the uniform were stapled. Fun patches and things for the back were in a baggie. I also had a spreadsheet view of all the awards each girl was receiving and jotted down the highlights on a list I had with me during the ceremony. Instead of reading off every thing each girl did, I would simply say "3 of the girls earned..." The exceptions were awards such as the Silver Torch, Service to Girl Scouting bar, etc. Those I mentioned who earned what, since those take a lot of effort. I invited a friend and Board member to join us and help present. I also invited our Media Coordinator for our Service Unit. I had Council mail me the certificates and pins and searched high and low for the perfect way to present. I chose the Silver Ore Ceremony. You need 5 regular candles and then 1 silver candle for each girl receiving the award. If you can't find silver candles, you could tie silver ribbon around them. This is the Silver Ore Ceremony I found and used... I changed several things with this to fit our group. I don't have enough girls to read the parts, so I changed the wording. I also did away with presenting flowers and such and kept it very simple. But, it was very touching. I tried and failed to find a Senior or Ambassador troop to help with our bridging. So, I invited a couple young adult Girl Scouts to come help. They were so gracious to attend! We had a short little thing to read (see below) and I gave their names to cross our "bridge". Once across they were greeted by our Board Member and 2 young adult Girl Scouts. They received their bridging patch and the Senior/Ambassador scarf was tied onto their neck. "Cadette to Senior: As Girl Scout Cadettes, you demonstrated leadership by helping younger Girl Scouts, and you began to understand the power of your voice, and the responsibilities of being a leader as you made more decisions in your group. As Girl Scout Seniors, you will have even more opportunities to Discover a wider world, Connect with more sisters and community partners, and Take Action through Journeys, and as you begin your pursuit of the Girl Scout Gold Award, the highest award in Girl Scouting. As each girl is called by name, she will receive her bridging certificate and award, and will be received by her sister Girl Scout Seniors. 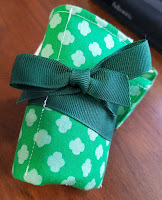 Please welcome our newest Girl Scout Seniors (applause)"
I made a Trefoil table runner with 3 trefoils on it. The background fabric I found on ebay. I believe it's uniform material for Brownie or Juniors from the late 80s/early 90s. Since we were doing a Silver Ceremony, I ordered a silver tablecloth from Amazon and silver candles. I also ordered rainbow bunting, a rainbow pennant banner, and frames for their Silver Award certificates (the certificates were provided by our Council, along with their pins). The setup was fairly simple. I used the folding table we use for cookie booths. Covered that with the silver tablecloth, table runner down the center, and 3 candle votives on the 3 trefoils. The 2 silver candles and 5 votive candles for the Silver Ceremony were all placed in front and lit as the ceremony progressed. 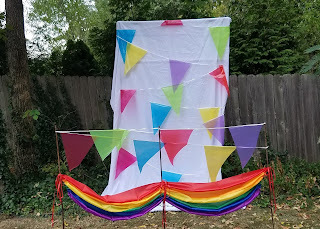 I also used the PVC pipe cookie booth frame we use and draped a white tablecloth over it, pinning it around the pipe at the sides and top, and used the pennant banner to decorate. Finally, 3 rebar posts were driven into the ground and the rainbow bunting was in front of the backdrop to form our "bridge". In the trees behind the table and then on the ground to light the path over the "bridge" I strung clear lights. Since we were doing this at 7PM, I needed the extra light and I do have to say... it was quite magical. I baked cupcakes with green icing and a single white confectioner's pearl to symbolize the pearls Juliette Low sold to pay for the first national GS office. We had punch made from Hawaiian punch, pineapple juice, and 7up. Then, trail mix which was a 70258 special... only the things they like (mini marshmallows, M&Ms, pretzel goldfish, and frosted cheerios). I don't recommend that for trailblazing... there isn't enough protein to help you out at all... but for celebrating, it's a sure fire hit. How do you celebrate your Girl Scout achievements? Share some memories of your grandparents. My Grandma Alice was a quilter and a baker (and a Baker... her maiden name). I don't remember a time where there wasn't a cookie in the red apple cookie jar (which I now have!) or a quilt in the frame to quilt or the sewing machine working on another quilt top. She was a decent cook, though I hated it when she put hot dogs in the mac & cheese... I still don't care for that. Grandma Mary crocheted and was a great cook. I loved her lemon pound cake and no one has the recipe. I've tried a many and never found one that has come close to the way she made hers. She had a huge garden and canned everything. Years after she canned and had passed, the peaches were still just as gorgeous and peach in the jars! She was the sweetest, kindest, gentlest person I have ever known. I am no one where near the level of compassion she had for people. She went through a lot in her lifetime. I aspire to live up to the standard she set with her life. I never met Grandpa Joe. He passed away before I was born. The stories I have heard vary between his days when my Dad was growing up and Grandpa wasn't the best person (drank too much, stayed away from home for days on end, never knew where he was) and when my older siblings were growing up and he was a good grandpa who favored my brother. I really just don't know that much about him. Did your family have special ways of celebrating specific holidays? Thanksgiving was not the normal "turkey" dinner... most of the time it was ham and all the trimmings. Christmas my parents have been flexible since the kids are grown and have multiple places to be... they swap years for eve and day of. Very thankful for that. 1. a person who has broken the law, especially one who remains at large or is a fugitive. historicala person deprived of the benefit and protection of the law. In my daily life, I follow the rules. I live up to the "social norm" I grew up with. I try to be a "good" person. I volunteer. I work. I am typically a good wife (come on, we all have a moment where we're not at our best). Also typically a good step-mom, too. I try to be a considerate person. I hope I'm a good friend. I am most critical of myself. I know where my full potential lies and when I fall short, I have no one but myself to blame. I don't accept the part of a victim in any area of my life. There comes a point where you need to challenge the "norm". I've felt that tug on my heart more and more lately. Remaining silent on topics seen in the news every day. Trying to remain neutral in conversation with those that don't share my views, even when they aren't as neutral in their conversation. I look at my 15 year old entering High School and pray for her safety. not because of gun violence but because of the types of questions she has to answer on a daily basis. I have even apologized for the world she is growing up in. She is facing turmoils I never gave a passing thought to at her age. I'm not sure where the turn on the path was made for society, but it was made. It makes me think back to a time when our country fought against itself. It's sounding too familiar these days and I keep hearing "history repeats itself" over and over in my mind. 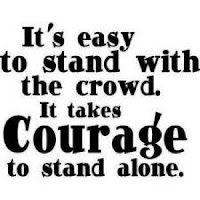 I know there is going to come a time when each of us has to take a stand for what we believe. Do you have what it takes to be an outlaw? 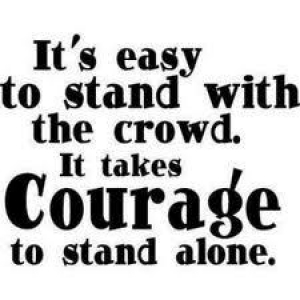 Do you have enough fire and passion to stand up for what you believe in even if it isn't the easy path? What will it take for you to say "that's enough!"? Are you willing to put aside your fears and commit to a cause? All of those questions are really for me. I don't know if I can answer them, either. I don't know if I'm willing to sacrifice friendships and open myself to scrutiny and judgment. The mere thought makes my head shake and I hear myself sigh. I'm not sure if I'm strong enough to be an "outlaw" in today's world. But, I'm feeling the tug... and until people stand strong for what's right, the world will continue to spin out of control. It's time to stop screaming for respect and remember respect is earned. You can't gain equality by oppressing the opposing side. Violence, in any form, is never the answer. 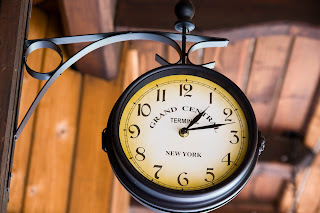 My final thought is this... are times really so much worse or is it that we are so much more connected? Are mountains really made out of a mole hills due to the escalation of those not physically present and affected? It's easy to fly into a frenzy when you are only given one side of the story. Take time and evaluate. Take a breath. Rationalize. Contemplate a plan that resolves. Don't throw gasoline on the fire and then question why it explodes. We need outlaws as described in this song. I hope I can be that kind of outlaw. What were some of your family traditions that you remember? Traditions revolved mostly around holidays... my Grandma would bake a ton of cookies and send them for me to decorate. But here are some "non-holiday" memories. Mom baked cakes when I was growing up as a small business. She would level the cakes and save the tops for me. I can't even count the number of times I had cake for breakfast. Best.Mom.Ever! Dad planted a garden each year. I loved helping him. So, he would plant the corn 3 per spot... he would drop 2 and my "job" was to follow and add 1 more. Same with beans. I liked the corn the best, because they added fertilizer to it that made the seeds hot pink. I was always disappointed that the ears of corn weren't pink. In the Spring and Summer, we would "go for a drive". We'd travel back country roads looking at fields and watching for wildlife. Sometimes, we'd stop for an ice cream on the way home. Crazy how simple things were the most memorable. in your mind about each of your siblings. My sister is the oldest, Leatta Jean. * Reminds me of my maternal grandmother, as she is always concerned about others and how they are doing. Are there any obvious or unusual genetic traits that run in your family line? I have one tooth on the left upper side that never came through the gum. 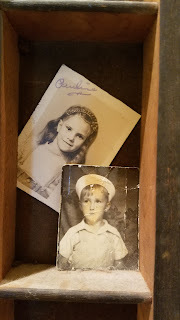 My Dad and his Mom both had the same thing. That's a little odd. My brother and I also have really bad knees, as did my Dad. 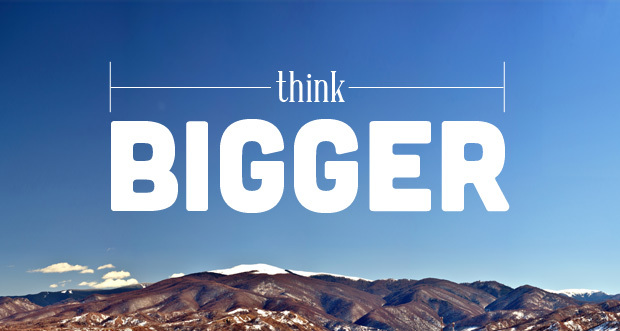 One of the hardest things as a leader is figuring out what to do and how to pull it off. I remember struggling to figure out things the group wanted to do. I know... girl-led... but, they don't know what they want to do either OR they come up with things to drain the account faster than you can blink. So... let's just say they need your guidance and help. Let's face it... it's also fun to plan activities for them they will be sure to enjoy. No one wants to hang around a bunch of bored people that are only there to do what they have to do in order to muddle through and leave. Now that my Seniors are planning their own things, I remind them they must entertain me or else I won't want to be there either. It's all in jest, sort of, but it's a reminder that it should be fun!! So... I'm here to help you out. 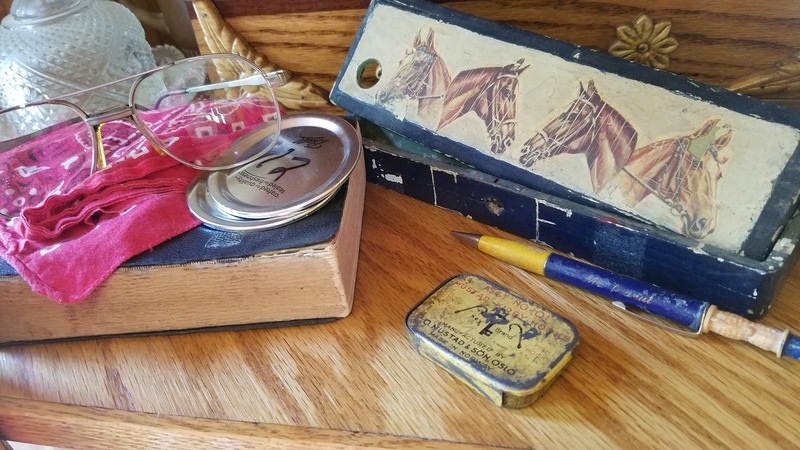 No matter what age you have... patch programs can supplement and provide a lot of great memories and add on more thrills to the other activities you are already doing. Photo shoot day for a great back-to-troop activity. Quick and easy program resulting in a great photo memoir. Complete the Shutterbug program. Fall Camping - Let's talk FOOD! With the release of Campfire Cookin' this month, I'm finding it hard not to keep searching for more and more recipes to try over the open flame. Whether you take your group camping or have a backyard fire pit cookout, you can earn this super cute patch. 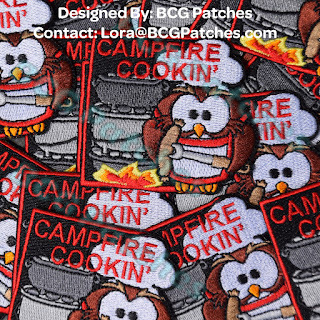 Whoooo wouldn't want a patch with an owl roasting a hot dog? Patches are available at BCGPatches.com They are for a limited time and guaranteed through January 15, 2018 (did I just type 2018?!). 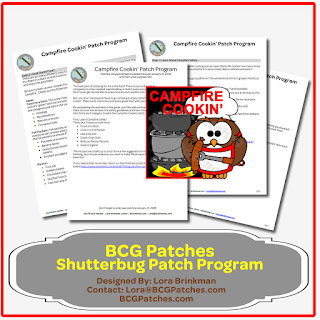 You can download the free guide and order the patch for your group today. Patches are in-stock and ship within 48 hours Monday-Friday. Did you know you can cook a brownie in an orange? How about a cinnamon roll on a stick? There are so many super fun ideas pinned to the Campfire Cookin' Pinterest board... take a gander. I had a pretty awesome childhood... I can't really think of any hardships or tragedies while growing up. what you remember of their death; the circumstances of their death. The first person I remember dying was my Aunt Ruby Fredrich. She had breast cancer and it spread, I think... I was little... I don't remember it all. Grandma Mary Elizabeth Love Pearon passed away when I was 14. She had pancreatic cancer. Grandma Alice Augusta Baker Fredrich passed away when I was 15. She had diabetes. Grandpa Leo John Pearon passed away when I was 18. My niece, Tracie Lea Nichols, was murdered in Durham, NC. She was 19. I was 24. She was my little sister more than a niece. This one event changed so much in my world. My Dad, Clyde Winford Fredrich passed away in 2015. He had Non-Hodgkins Lymphoma. I have had several uncles and aunts that have passed away, too. It's weird to me when people have never had anyone pass away. I have been to more funerals than I care to count. nurse, stay-at-home mom, professional, laborer, and so on)? Dad was a farmer and hired hand at various farms when my parents were first married. In my lifetime, he farmed fora couple years and then took a job as a custodian at the public school. Then, he changed jobs and was the City Maintenance Superintendent for our small hometown. He pushed snow, took care of the water towers, sewer treatment plants, and pretty much everything the town needed in relation to streets, water, waste. He also hung the Christmas lights in town, which I think was one of the coolest things I told me friends about his job. I was very proud of what my Dad did for the town. Almost everyone liked him and if they didn't, it was probably because they were just unreasonable. Mom was a stay-at-home-mom for part of the time. She also sold Tupperware until I was born. She owned her very own cake decorating business and made tons of all-occasion cakes and wedding cakes. That must be where I got my entrepreneurial spirit. When I started 1st grade, Mom took a job at school as a Teacher's Aid in the Special Education department and did that until I was in Middle School, I think. She then switched to the Library Aid and ran the Elementary library. There was no where in town or school I could go without someone and everyone knowing who's kid I was. There were times I hated that Mom was at school and knew everything I was doing and friends with my teachers. There were also times I was so thankful she was there. She always made sure I knew I was more important than the job, too. I know there was a couple times she could have lost her job for standing up for me at school with teachers, too, but she didn't seem to care. I was her little girl and that was the most important thing to her. My Dad may have plowed a few driveways shut with snow on purpose to prove a point to a couple teachers who were giving me a hard time, too. Ha! Don't mess with their little girl! My Mom (who I believe will be reading this...) is selfless. Her entire world revolves around her kids and my Dad, until he passed. From an early age, she has always cared for someone... siblings, parents, sister-in-laws, in-laws, children, church youth, and I'm sure I'm forgetting groups. She was born December 6, 1941 to Leo and Mary Pearon in Linn, MO at home. My Grandma was very ill after she was born, so the doctor's wife actually cared for my Mom for a while as an infant. She is the youngest girl, but she has 2 younger brothers. She had 5 siblings, one who was accidentally killed when he was 15. Her family lived on a large farm and worked hard. They weren't rich by any means and Mom has told me a few times of getting clothes from friends and family, because they weren't able to afford store bought clothes. My Mom went through a lot of struggles in her lifetime that I have been fortunate enough not to face, I'm sure in part because she didn't want her kids to experience those trials and did everything in her power to make sure we didn't. At 5, I was scared to death while Mom was driving back from my sister's before my first day in Kindergarten in a hail storm and swearing the truck was going to fall apart... but my Mom was calm and steady and we got home safely. at the time I thought she was insane (pre-teen and teen years), but pointing out how smart and kind-hearted I was and that was one of the reasons I struggled to get along with the "popular crowd", because I didn't want to go along with their antics... and yes... Mom, you were right... they were jealous and it was the age. okay.. this is ornery and she'll probably text to say she can't believe I shared this... but... when I was little and getting into trouble and she was at her wit's end (if you have kids.. you have been there!)... she would tell me "I'm going to pinch your head off and tell God you died!" Horrible, right? HA!! It got my attention and I knew she wouldn't actually do it! But, it sure did stop me in my tracks and I shaped-up fast. There are so many memories I have with my Mom that I can't list them all... from chocolate cake batter pony tails to rescuing her orange haired daughter when an at-home color treatment went awry to supporting me through every difficult time in my life to vacuuming outside my bedroom door when she knew I was up later than I should have been (a bit passive aggressive there, mom...ha!) to becoming friends as adults... She put up with a LOT from me and I'm thankful she didn't really pinch my head off... and I'm sure she has shed many tears over me and prayed the night away and for that I am genuinely sorry and so thankful... I promise.. I'll get it together one day. 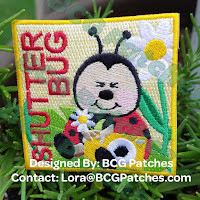 Have you seen the July release from BCGPatches.com? Encourage your group to capture some memories and earn a cute patch! 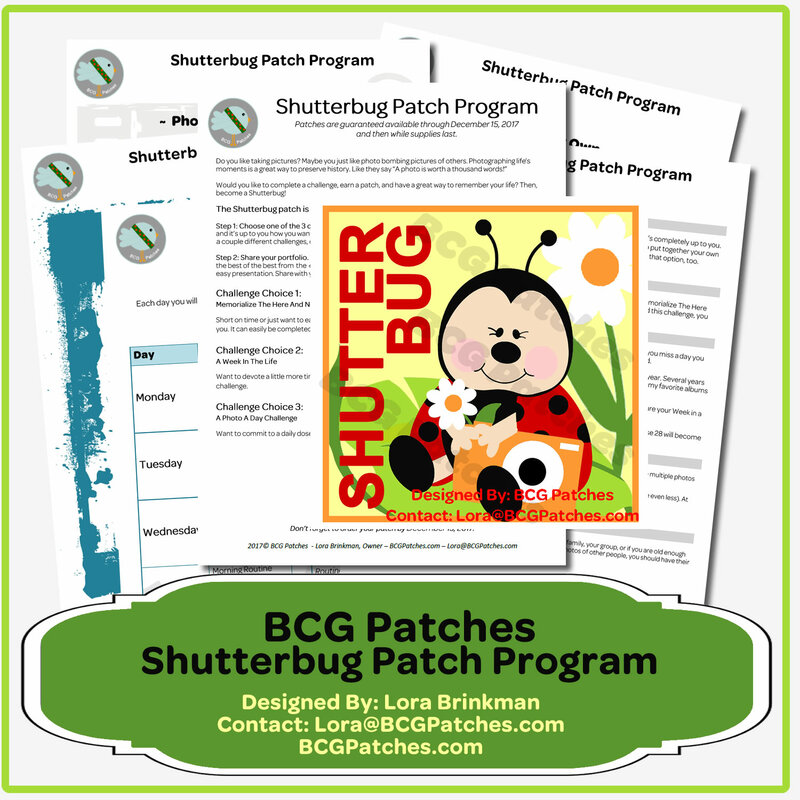 The Shutterbug patch is earned in two steps. Choose one of the 3 photo challenges to complete. There are at least 3 different ways to earn this patch and it’s up to you how you want to complete it. You can do one of the challenges, a “hybrid” combination of a couple different challenges, or come up with your own. Share your portfolio. With our awesome digital age, you’ll probably be taking lots of photos. Keep the best of the best from the challenge you select. Have them printed or save them to a special folder for easy presentation. Share with your friends, family, or group. My Dad was amazing. I could stop there and be quite satisfied with the answer. He was born to Joseph and Alice Fredrich in Linn, MO on December 16, 1938 and named Clyde Winford Fredrich. I am such a Daddy's girl. I would race out the door after dinner to help him in the garden or with the chickens or whatever he was doing. I love the memories I have of riding with him on the mower or the tractor. I can still smell his aftershave when I think of him. He would ask me to ride along to check the water pumps in town (part of his job as City Superintendent) on the weekends, which I knew meant we would stop for ice cream. He loved my Mom so much. His kids were everything to him. I hope I can honor him with my life. He was a great man and I miss him so much... every day.. since he passed in 2015 from Non-Hodgkins Lymphoma. He was the strongest man and fought with everything in him to beat cancer. But, it overtook him. I miss him so much... he was the best Dad on the planet and no one will ever come close to the level of admiration and respect I have for him. He could do anything and always made sure I knew I can, too. I'm thankful for everything he taught me. I ran across this challenge about a year ago and thought it was a marvelous idea... A year later... I never started it. Better late than never, right? Week 2: When and where were you born? Describe your home, your neighborhood, and the town you grew up in. I was born March 6, 1977 (yes, do the math... 40 right now). I was born at St. Mary's Hospital in Jefferson City, MO. It was snowing the day I was born and almost 80 the day they took me home. It was Sunday and my arrival was announced at church. I don't remember the house we lived in until I was almost 3. This home I remember is where my Mom still lvess. It's a 4 sided red brick home, 3 bedroomm, 1 1/2 bath, full unfinished basement. We lived about 2 milesout of town. We could see our neighbor's homes, but there wss space between us. Mom and Dad had 10 acros of land. Town, Linn, MO, was small. We knew everyone and their family. So... be prepared... I'm going to start blogging 1 question per week. If you have a blog and want to join me, please link in the comments. I'd love to follow your journey, too. The story goes... my Dad didn't want me to have a long first name, as he felt it was cruel to do that to a child who had to learn how to spell their name. I find this a little funny, because apparently my Dad didn't think I'd be too intelligent or something. Ha! My Mom wanted to name me Loralea after someone she knew, but Dad convinced her to shorten it to Lora. "lea" would have also been a tribute to my older sister, Leatta", but they were overruled. My middle name comes from a lady my parents went to church with. My mom promised her if I was born on her birthday (March 6) she would give me the same middle name as her, Ann. Well, I was born on her birthday, so that is the middle name I received. My maiden name is Fredrich. It's a derivative of Friedrick, which is German. When my great-grandparents immigrated to the US, as with many people, their spelling or their surname was changed. My Grandma often told me it was because my Great Grandpa didn't want to be associated with a side of the family that still spelled their name "the old way", but I seriously doubt that story. She also told me an entire branch of the family was disowned because the man married an American Indian. They weren't what I consider "high-society", so I just don't know if I should buy the stories... but, maybe. Nonetheless, that is my name and I hope I live up to the expectation of my ancestors. My troop typically doesn't meet over the Summer months. We meet during the school year and then when school ends, scouts ends.. until the next Fall. This year we are doing something new. We are going to get together to complete a Journey in a Day. Senior Journey Mission: Sisterhood. A couple reasons for this. 1) They are BUSY!!! My girls are going into High School and I am full aware that our meeting frequency will be drastically different. Two of the girls are in Marching Band (you should see that schedule!). Two are in cheer. All have multiple clubs and things they do besides scouts. 2) The older they get, the harder it gets to keep them interested in scouting. They are torn in a million different directions. I'm chuckling to myself here a tad, because I realize this is only the beginning of our young women having to make choices and feeling pulled in different ways. It doesn't get any easier, does it? What's worse is that a lot of times it's our own gender criticizing the most... stop that, okay? If you want to keep them in scouts, you have to keep them interested. Here are the 5 ways I hope to keep my scouts interested through their Senior year in High School. The first thing we need to realize is, scouting is only one option they have. ONE of many. Scouting is awesome because you don't have to practice every day like sports. You don't have to take expensive trips. You don't have to have a set in stone schedule. We can be flexible and we should be. This is their Freshman year. I hope to meet with them one time a month. The theme of the month will be different and they will be setting that schedule and theme for the year at our first meeting this Fall. If they miss a meeting, it isn't the end of the world. Do I want them there? Absolutely! But, keep perspective and understand they are beginning their transition into the "real world" where schedules get tricky. Choices have to be made. You can't be in two places at once, no matter how hard we wish we could. You want to keep them in scouts? Keep it easy! They are in school all day long. Scouting should be fun. You can learn through playing at any age. Don't forget that. Get them outside as much as possible. Get them laughing and playing. Yes. Playing. We're not jump roping and hopscotching, but you can and if your girls want to do that... do it. But, find ways to let them let loose and have a good time. If they feel like they are going to sit and stare at a book for the whole meeting, they aren't going to want to be there... and let's be honest... I don't want to be there either. My girls got on a Sculpey clay kick for a while. Each meeting their plans included making something out of clay. They loved it. They were tying it in with their badge, so let's do it. The one thing we did this past year that was requested time and time again... Uno and Spot It. They would plan their badge work to get done early, so they could play games. Game time would erupt in laughter and memories. Time well spent. It doesn't have to be about earning a badge all the time. Promise. Life skills where they are learning how to let themselves be silly and relieve stress... those are skills that will pay off time and time again. Keep it fun to keep them in. Starting with their 7th grade year, the girls started planning all of their meetings. My co-leader and I helped them come of with ideas when they didn't like the suggested activities. WI have helped them organize thoughts by giving them a sheet for planning. It also helps me know what supplies they are requesting. I'm sure we have all heard "if you want a child to eat something new, have them help prepare it." Well, that mindset transcends into scouts. You want them to stick around? Make sure they are involved with the planning and decisions. You are more likely to show up if you take ownership in the activity. Yes, I do plan the large things for them, such as the Journey in a Day programs. But, they still give me direction. I listen to what they like and don't like. I pay attention to what they have really enjoyed and the stuff they could do without. In fact, they asked me to put the day program together for them. They still enjoy being able to show up and participate without all the prep. I'm fine with that, because I still like to feel needed. Girl-led doesn't mean they have to do all of it. Girl-led means they give input and set the direction and make decisions together. Remember, these girls are BUSY. Don't pile "one more thing" on them all the time. They'll choose to leave, if you don't help them out. Plus, let's be honest, they are entering into a world where they will have so many things dumped on them... cut them a little slack. Prepare them, but don't overwhelm them! Follow their lead. If they want and ask for your help, then that is still girl-led! As they enter High School, they enter a new world. They are immediately expected to start thinking about college, career, and life choices. Not to mention all the scholarships and advanced placement classes students are just expected to do. It's a lot different than when I was a High School Freshman. They also have to think about how to make themselves most interesting to perspective colleges. No more is it just about the grades and the course work. It's about the extracurricular activities and volunteer work. They have a lot to think about. For the most part, college isn't an option... it's a requirement. When it comes to scouting, keep it low stress. Work with them and ask them what works. Ask how you can help relieve the stress of their every day life. Encourage them to keep that line of communication open as their lives change. Don't pressure them to do everything and be at everything. Remind them you want them there, but you also understand. Let me tell you something brutally honest... if you are bored at a meeting, so are they! Help them plan activities that inspire and motivate. I don't know about you, but I have enough things I "have" to do that aren't fun. When it comes to scouts, it needs to be engaging. 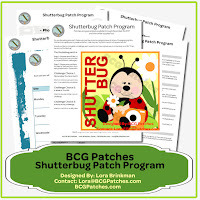 Bring in some patch programs to learn some life skills where they have something to show for it. If they like cooking, check out Share the Season. Do they love singing? Complete Just Sing. Are they artsy? Ask them about Handmade Treasures. I love the world wide web (most of the time). It's a happy little place where you can connect with others and find that people really aren't that different. We all want the same basic things as we travel along. I ran across this challenge on Family Search to answer 1 question a week. Instead of being overwhelmed to document you whole big ol' life, you take it one question at a time. They are in their 2nd year now, but I'm playing catch up, I suppose. My goal is to post a blog entry... 1 per week... to answer 1 question. In the process, I hope you are able to see we are so much alike and yet unique and lovely in our own ways. Are you in? Jump in at any time. This has been a labor of love. I am hosting a Journey in a Day program for my brand new Seniors this July. They have expressed the need for Journey in a Day events and not a semester of meetings for a journey. They want to do other things, too. I spent a number of hours developing a plan. I used a few other references (namely the Turnkey from GSCNC) and the Leader book to pick and choose ideas. Then, I brought in my own twist to make it a little more "fun". At least, I think it's more fun. The Journey in a Day program I put together is a 9 hour program, but you aren't just doing the journey during that time. There is also time for lunch, afternoon snack/ceremony, and dinner. Plus some game time, craft time, and chill time. There are 20 activities in all and I have tried to use time wisely, yet not rush through the more important items. I am planning this for a group of 6. 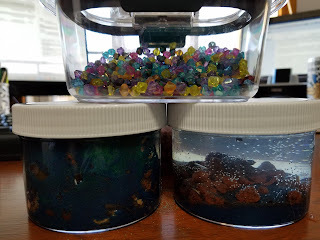 If you are hosting this for a larger group, I suggest you break the activities down and set up stations or turn it into an overnight activity to make sure you have enough time to get through everything. You could also cut things out, if you want. The Take Action project is not completed with this journey in a day program. 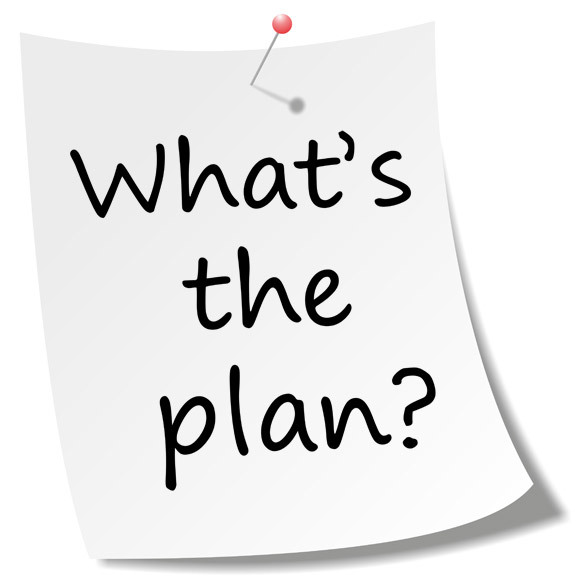 The girls will discuss what to do and a plan will need to made to make that happen. I typically try to encourage them to keep perspective and not lasso the moon for a Take Action on a journey. Lasso the moon for your Gold Award, instead. The plan is to encourage them to set up a Movie day and invite other troops and people and do some SWAPs and dinner and watch a movie or something. Expand your network and keep it realistic. Our troop does a service project every month, so believe me... we're expanding the network and reaching out all the time. This is the good part... it's probably easier for you to just download the information and read through it and think it out. Lots of information in there and all the activity cards you need are included. You just need to add some basic supplies and girls. 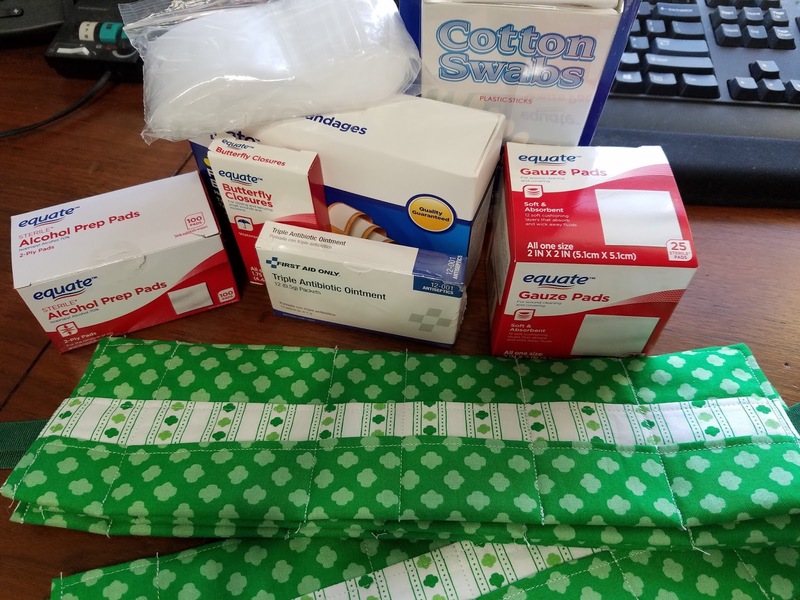 I even included a Supplies List for you by activity so you know what you need. 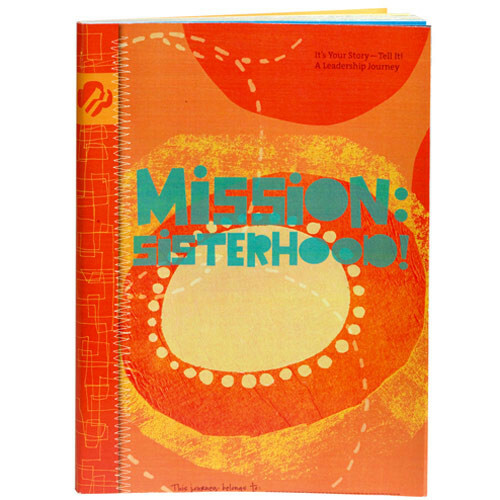 Mission-sisterhood-journey-in-a-day-program.pdf - This is your one stop shop. 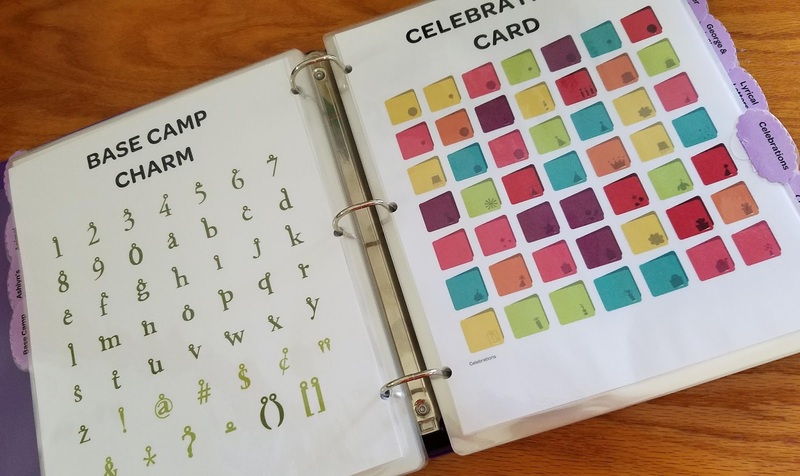 It's 27 pages including the Overview, explanation, time chart, activity list, activity cards, and more. I've included blank cards, too. It's a PDF and you can't edit it. I spent a lot of time putting these together and I don't want to provide any of the cards in editable format. Mission-Sisterhood-Journey-In-A-Day-Planning-Blog.docx - Speaking of editable format... The program activity chart would be very helpful to you if you could fill in names and change the times, rearrange activities, etc, right? So, that's the one piece I'll provide in Word. I don't have plans to provide it in any other format. It's included in the big ol' PDF, so if Word doesn't work for you, you can use the PDF and make it work. I'll try to remember to add some pictures after the event is held. If I don't, don't stone me... remind me, though. 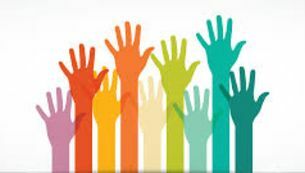 Our event is going to be help July 22, 2017. I have a post on planning a journey in a day program, if you want more tips and tricks. This is loosely related to Girl Scout world. If you don' think you can use this for anything scouting related (which I'm sure you can! ), please skip over and enjoy your day! crafter. I love scrapbooking, cardmaking, stamping, home decor projects, and all the like. My amazing, awesome, totally supportive husband bought me a Cricut Expression for Christmas or my birthday or something... it's been like 10 years, okay? I still have it. I still love it. 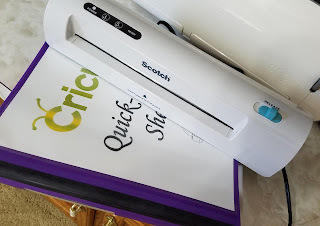 I do not want a Cricut Air. You know why? I hate the idea that I have to design everything on my laptop or tablet. This coming from a highly techie gal. I want to plug in the cartridges and set the size and press cut and be done with it already. So, yeah. Anyway, this past week I splurged on a little item for myself and I am over the moon happy. This will give you insight into my personality and Type A-ness. I bought... wait for it... a laminator!!! You know why? Because of this project!! I saw a post somewhere (I don't remember where, because... well... I hop around the internet faster than a bunny on Jolt soda; if you don't know what Jolt soda is, then you are most definitely not my age). 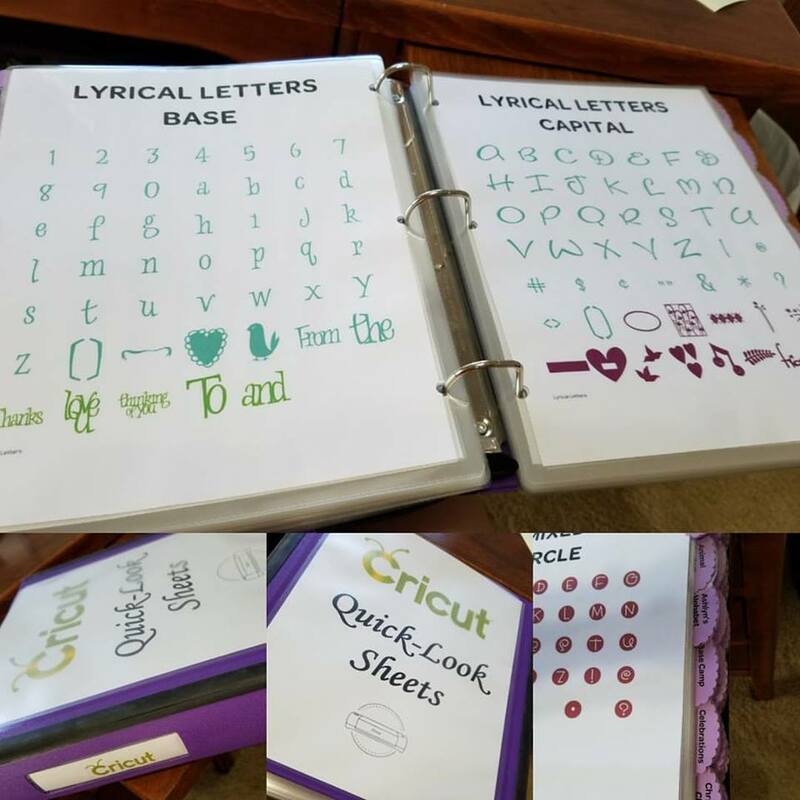 The post showcased a binder of Cricut cartridge images used to quickly flip and decide what font you want to use. Oh... it spoke to me. It spoke to me loud and clear to the point I was conviced I MUST make one. I put all the images into Word with headings on each page and uploaded my happy little file to Staples and had them printed. The laminator arrived. The binder was waiting. 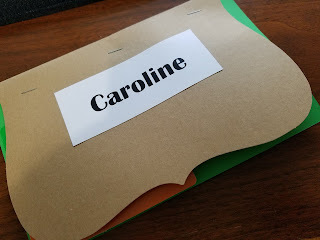 The sheets were laminated and hole punched. I can't even tell you the level of "OH MY GOODNESS" my little heart was screaming at the gloriousness (yes, I know that isn't a word... chill) of it all. 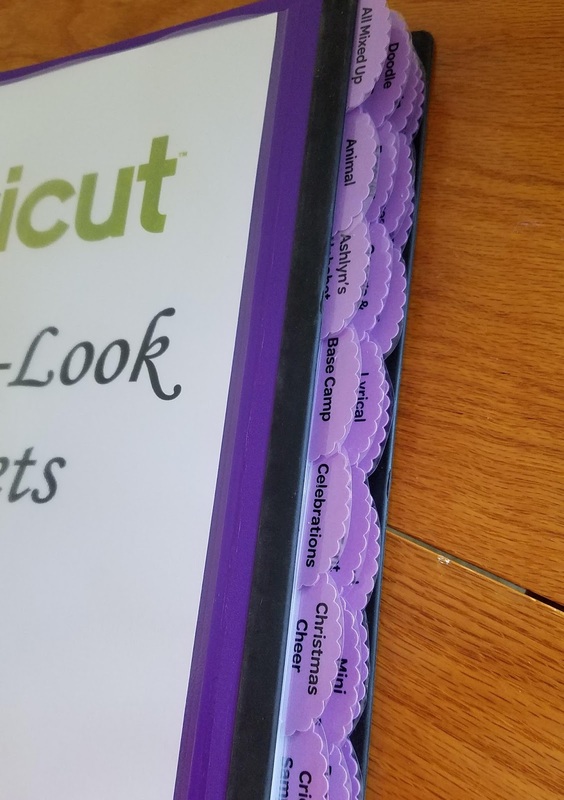 Then, came the problem... tabs... regular page dividers don't work because the lamination sheets are wider than the dividers. Back to Google I went and WOO HOO a solution. Then, I tweaked that idea a bit and did my own thing. * 137 sheets printed by Staples in color; I didn't do double-sided because it was $12 more... ridiculous, I know. Put them in alpha order in the binder, because what other logical way is there??? Made a cover sheet for the front of the binder and a spine label, because why wouldn't I? I probably spent a good 6 hours doing all this, but it's so cute and I know I'm going to use it every time I use my cricut. I also found out that at least 2 of the cartridges I own have things on them that I didn't even know existed! Did you know Robotz has a FONT?!?!?! 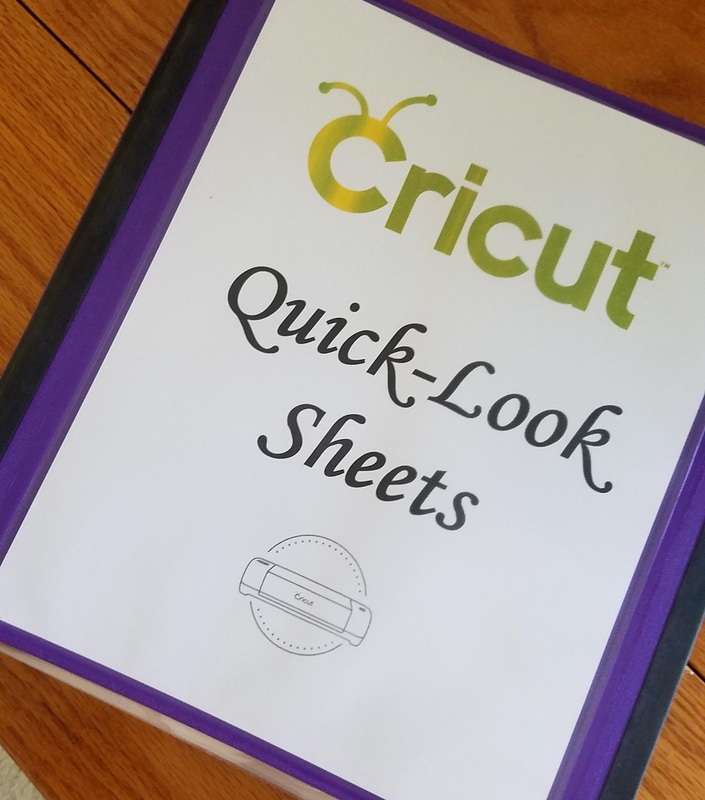 My Quick-Sheets are not meant to replace the books. They are to help me quickly flip and glance at fonts and not have to go through all the books every single time. It helps narrow it down and then if it's a special cut that I can't figure out from the overlay, I can always grab the book. Like I said... this isn't really scouting related, but it makes me really happy and thinking of all the ways I can use my laminator and my cricut... WOO HOO!!!! Also, the little tab idea could be used for so many things... ooooohhhh... I love organized things! !